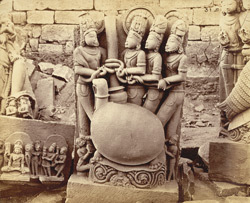 Photograph of a sculpture of Kurmavatara (tortoise incarnation of Vishnu), from Garhwa, Allahabad District, taken by Joseph David Beglar in the 1870s. At Garwa there is a pentagonal shaped compound inside which are the remains of a temple and other structures, many of which are now un-identifiable. The earliest remains date to the Gupta period however the site was occupied for a number of centuries. This is attested to by the many different styles of sculpture that have been found inside the compound. In this photograph, the broken piece was part of a frieze depicting the myth of the churning of the milk ocean. Vishnu, under the shape of the tortoise Kurma, holds firmly the base of the mount Meru used by the demons and gods as a rod and Vasuki the serpent as the rope to churn the ocean to obtain the amrita or elixir of immortality.